Our Community - Jill Hepp - "Protecting and preserving a piece of paradise"
What makes Belize so unique, apart from its natural beauty, is the people who have chosen this place as their home. Belize boasts various ethnic groups as well as a large number of people from all corners of the world who have immigrated to this part of Latin America. Some have chosen Belize and San Pedro as a retirement home, while others have found an opportunity for business here. There are also a number of people who have moved here unselfishly, in the spirit of volunteering, to help improve the quality of life for all the residents. That is the case of this week's personality who, because of her goal to make the world a better place to live, has become a great asset to San Pedro - Jill Hepp. Jill was born in Wapakoneta, Ohio on August 16th, 1977 to Joan and James Hepp. Being the only female child in this family (two brothers, Matt and Mark), Jill grew up surrounded with much love and attention. In 1996, this ambitious young student graduated from Wapakoneta High School and then (in May of 2000) from the University of San Diego, California with a Bachelor's Degree in Biology. At that time, while other students were making plans to achieve a Master's Degree, Jill was seriously considering moving to a distant land, and felt she could achieve this by joining the Peace Corps. Her brother Mark had a positive experience as a Peace Corps volunteer and pushed Jill to join this organization. She had already made up her mind, if given the opportunity, to be situated in Latin America because of a memorable time she spent in Ecuador and Mexico visiting her brother, and also because she wanted to learn the Spanish language. Jill did not hesitate to apply and after her skills were reviewed, Peace Corps offered her a position as an Environmental Educator in Belize. She accepted the proposal and only one week after graduating, Jill was off to Belize. Once situated in this small Central American country, Jill underwent eight weeks of community-based training with families in Burrell Boom and Belize City. During this time Jill received a crash course in Belizean history, culture and politics, and even attempted to learn the Kriol language (another dialect spoken in Belize). Midway through her training, Jill was introduced to the various openings available, which included positions at the Belize Zoo, University of Belize and Green Reef. Her educational background perfectly suited the position available at Green Reef, a non-profit organization in San Pedro dedicated to promoting the sustainable use and conservation of Belize's marine coastal resources. Jill was given the task of Environmental Education Program Director for Green Reef. Working closely with the Green Reef President, Mr. Mito Paz, Jill has been kept busy writing grant proposals, planning events such as the annual Reef Festival, and carrying out projects such as coral reef monitoring and a Nassau grouper aggregation program. 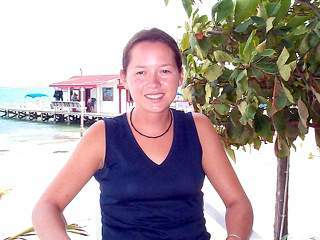 All of Green Reef's activities have given Miss Hepp great satisfaction, especially teaching educational courses in marine ecology at various schools on the island. "This has been my favorite part so far," Jill told The San Pedro Sun. "It has given me the opportunity to know the teachers and the children." Jill has been working tirelessly in San Pedro for almost two years now. During this time she has managed to take up windsurfing, a sport she enjoys immensely. She has also joined forces with SAGA, San Pedro's humane society, educating students of LIFE and The Island Academy about the treatment of animals, along with her other environmental subjects. When Jill's two-year contract with Green Reef comes to an end in July, her goal is to work for a large international conservation group for one year. She then hopes to pursue a Master's Degree in Conservation Biology before returning to Latin America. Jill Hepp has indeed been a wonderful gift to the people of "La Isla Bonita". Her vast knowledge of environmental science and skills at conserving our natural resources have been absorbed by residents of all ages who are thankful for her great spirit of giving. San Pedro will be sad to see Jill Hepp leave but will always appreciate her teaching us so many ways to help preserve the natural beauty of "Our Community."